palazzo pants = best pregnancy pants ever. seriously. i'm honestly thinking i may be able to skip out on buying any of the stretchy band maternity pants and just wear these bad boys for the next few months! they have been making life easy and comfortable and those are two things that go well in my book! they are also so lightweight that i could wear them all summer and not feel like i'm baking in a sauna. bonus points. as for the rest of this getup, i've been definitely channeling my inner hippy these days and loving it. i even think i've found the perfect way of doing the boho/beach wave curls (as seen below) and will have a tutorial coming soon. the best part is that they are no heat curls and are so much better for your hair than using a flat iron or curling iron and they give the perfect look! watch for the video- hopefully coming soon! Shoot, I have been eying those pants at Windsor and may need to pull the trigger on them:) You look amazing, love the headband! I love those pants! Plus they look ridiculously comfy! gorgeous pics! did you get a new camera or lens?? What is it?? So cute! They make your legs look a mile long! how on earth are you 27 weeks pregnant!?? you are so so extremely petite! i can't even handle this cuteness. Love those pants! 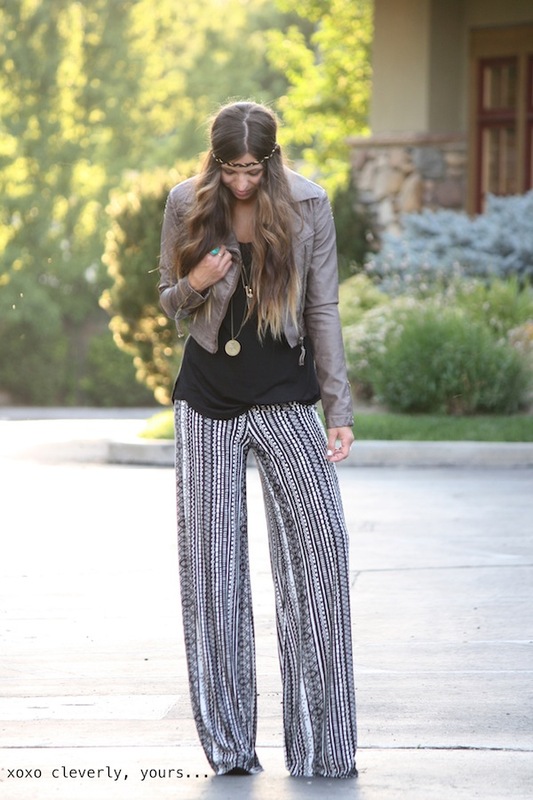 Your boho style is amazing!